A seemingly ordinary young man forced to become a guru takes a leap of faith and sets off with his followers on a taxing journey that changes their mindsets and lives forever. Inspired by the carefree life of a sparrow, reluctant guru Partibhan takes off on a 600 kilometre expedition on foot to test his theory of practical spirituality. He believes that human beings can become powerful creators, but the desire to secure the future makes them mere survivors. However, survival isn’t the only goal of life. A much bigger role, a higher calling awaits us. Will Guru Partibhan and his disciples complete the journey? Will they discover their true potential and find everlasting joy? Looks at the importance of spirituality in today’s fast paced world. A must read for all those feeling burnt out and wondering about the ‘higher purpose’ of their lives. The story of a young man who finds his calling in life, written in a relatable manner. 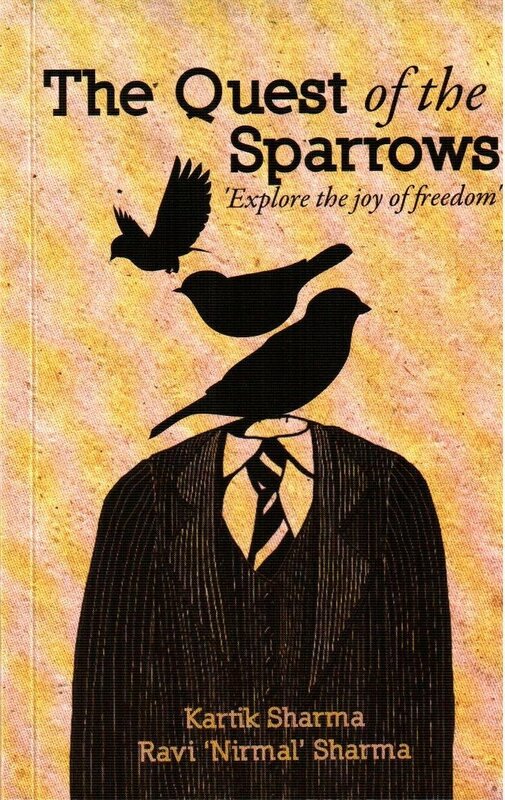 The quest of sparrows is a book which will take you on a spiritual journey to quench your thirst to know about life. Nikhil, from London is a normal man with every luxuries. But his disoriented family sets him to take a spiritual journey to India in search of peace. Sanjeev, a detective was alloted a mission to spy on the great guru, Parthiban to find whether he is a real guru or a fraud? Parthiban, the great guru ascends the throne after his dad Parmanand. Having experienced a dark past after his father left him alone to take over the spiritual path, Parthibhan loses faith in both divine and his dad. Further the story is built on how Parthiban realises his worth and his connection with divine. Later he practices practical spiritual journey of 600 kilometres with his followers and preach them what life actually is. Further, the book is built on how the spiritual journey affected the life of these three people and also the life of other fellow followers. The book is not just a spiritual book but also if serves as a self helping book which teaches us the meaning of life. Every events which occur during the spiritual journey leaves an ever lasting message to the human kind. The book is very well woven with motivational thoughts and it grips the readers to the story till the end. It enlightens and purifies the soul of the readers. The book is composed with simple words and lucid language. Also it is divided into many chapters which makes the reading easy. The first person narration helps to maintain coherence with the book. The characters were also neatly explained with utmost reference. The theme is engaging and helps to attain more knowledge about divine. The book cover deeply explains the content of the book to unleash the locked soul from the caged body. The title and the tagline sufficiently supports the theme and grabs the attention of the readers. The blurb could have been more detailed to give some clue on the content of the book. Verdict : A life changing book which blesses you with a new perspective to see the outer world.